This week, Tanner Reese takes an in-depth look into Cliff Pu's hot start with the OHL's London Knights and what the Sabres may have seen when selecting him at the 2016 draft. If on June 25th, 2016 a Sabres fan following the NHL Draft thought, “Cliff WHO?” when the Sabres selected Cliff Pu with the 69th overall pick, I wouldn’t blame them. Pu was certainly not considered a can’t-miss prospect, and was ranked 75th on NHL Central Scouting’s final ranking for North American skaters. If you hadn’t recognized the name and did a quick search for his OHL statistics to get a feel for why the Sabres wanted him, you’d have found that he scored a mere 31 points in 63 regular season games. You’d also have seen that he reached another level to his game during the London Knights’ run to the Memorial Cup, scoring 13 points. 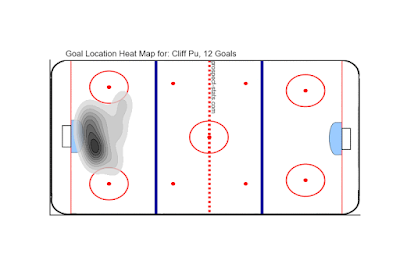 Pu scored eight goals in those 18 games after only managing 12 in the entire regular season. 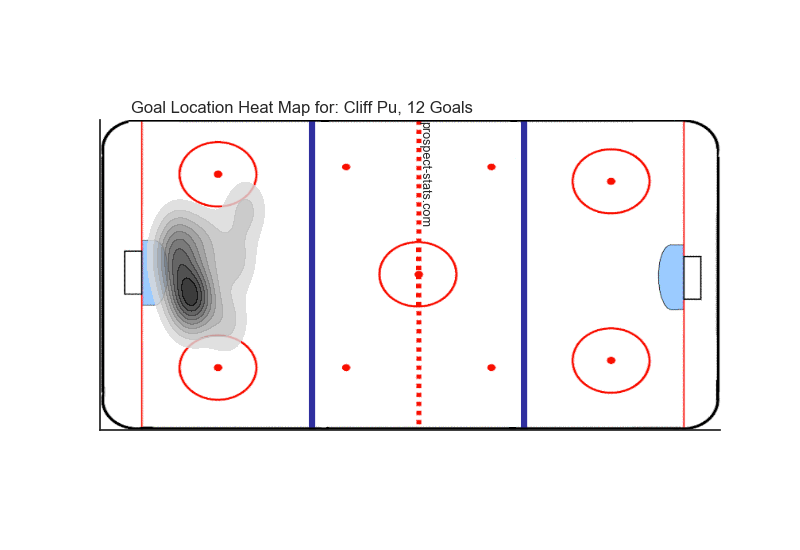 Throughout the regular season, though, there were signs that Pu was getting shots off from areas in-between the circles, places where most goals in the NHL are scored. As you can see on the heat map of Pu’s 2015-16 shots, his shots were concentrated in the low slot area. He scored a lot of his goals off of rushes, using his explosive skating to break away from defenders and get in alone, as well as to get in positions to tap in rebounds. Pu played a lesser role on the Knights last year because of their astounding depth, but he’s taken on a greater role this year and is flourishing as the team’s top pivot. He’s leading the OHL in faceoff win percentage, winning 61.4% of his draws. Last year, Pu placed 101 shots on goal in 63 games for an average of 1.60 shots on goal per game. In only 11 games this year, Pu has 49 SOG for an average of 4.45 SOG/game. In their 4-3 loss to the Sault Ste. Marie Greyhounds on October 28th, Pu had an amazing 13 shots on goal. Thirteen. That’s an insane uptick in production from last year, and his goals and assists have followed the same upward trend that the rest of his game has. Pu has 19 points this regular season (17 primary points: meaning goals or primary assists), and his 1.55 primary points per game are good for 5th in the OHL. He’s not only benefiting from power play time, with 13 of his points (all primary) coming at even strength and one of his goals being shorthanded. According to prospect-stats.com, Pu has a 32.54 Relative Goals For% at even strength. That is to say while Pu has been on the ice, London has scored 32.54% more of all goals scored than London has when Pu is off of the ice. That’s 9th in the OHL for players who have played in more than 5 games so far this year. Looking at Pu’s 2015-16 counting stats may not have inspired Sabres’ fans to be excited about his future as a top prospect in the team’s system, but his season so far has been nothing short of a revelation. Credit should be given to the Sabres’ scouting staff for recognizing that Pu was effective in a limited role last year and that an expanded role may lead to a break-out. If Pu can keep up this frenetic pace of offensive production, it will go a long way towards replenishing the Sabres’ prospect system that has been thinned by trades and players graduating to the big club. After ten games, the Sabres’ bet on Pu was seemingly a smart one.